Chef Kevin Johnson began his career in Charleston at Slightly North of Broad (S.N.O.B.) 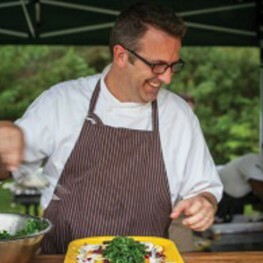 while attending the esteemed culinary institute, Johnson & Wales University, Charleston, S.C. After graduation in 1996, he returned home to Virginia and worked as sous chef for three years at the Inn at Little Washington. In 2003, he moved back to Charleston to serve as executive chef at Anson Restaurant. After almost seven years at Anson, he joined the REV restaurant group as executive chef, overseeing all REV kitchens which included Taco Boy, Closed for Business, Poe’s Tavern, and Monza. He was also an Adjunct Chef Instructor at the Culinary Institute of Charleston until fall 2011.